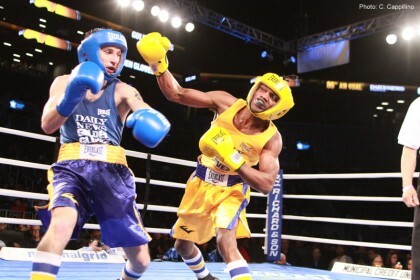 photo by Christy Cap – For the first time, Brooklyn’s magnificent Barclays Center hosted the traditional Daily News Golden Gloves Finals. To a cheering New York crowd, determined amateur boxers tested their courage, skills and endurance. First the National Anthem, then the 10 Count, ten strikes of the bell in memorial of boxing greats in and out of the ring, and it was time for the action. (176 + Women) Both fighters came out meaning business. Krystal Dixon moved and used her reach to score with over-the-top rights and used uppercuts to fend off a relentless Jessica Kenul. Multiple hard rights in the 3rd and 4th round helped secure a Dixon victory and the Golden Glove Boxer of Tournament Award. (141 W) An uneventful, sloppy boxing, “I-don’t know-what” fight with Bertha Aracil defeating Nafisa Umarova. (125 W) Christina Cruz snapped and picked her punches against a hard battling Welley Wallo for a Cruz win and record breaking 7 Golden Gloves titles. (178 Open) Jeff Laguerre scored with more 1-2 left-rights to Antoine Evens head along with some solo rights for the championship. (114 Novice) Fast moving and furious trading punches with Michael Santos pressing and scoring better overall. Francisco Medina received a bleeding nose and standing 8 Count in the 3rd round that sealed a Santos win. (152 N) In a close match, a hard hitting Beka Gulbatashvili with a hands-dropping style let Jovanny Concepcion get in his own counter punches. Judges gave the win to Beka. (165 O) A fast paced, hard hitting trading bout with a win for Christopher Galeano over Frank Castillo. (132 O) An even-trading match up, but with way-too-much-holding by both fighters. Judges gave bout to Titus Williams over Vassiliy Zherebnenko . (123 N) Excellent, fast, high action bout with a lot of flurry scoring for both boxers and a James Wilkins victory over Jeancarlos Sepulveda. (201 O) A fast, fine-boxing Earl Newman scoring and ducking a powerful, heavy hitting Ngoula Romanick for a skillful Newman win. (141 N) A quality, continuous, with body and head blows, in-close fighting bout with a Paul Anthony victory over Michael Damiani. (201 + N) George Arias with a lot of show and some hard hitting, but Nkosi Solomon dodged and scored anyway to end the performance, and win. Previous boxing news: Dereck Chisora Still Angry At Wladimir Klitschko For Pulling Out Of Defence!